The Bar Professional Training Course (BPTC) student has taken top honours among the finalists in The City Law School’s premier mooting competition, sponsored by Falcon Chambers. 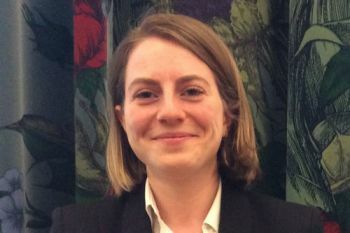 Esther Drabkin-Reiter, studying on The City Law School's Bar Professional Training Course, won the trophy and the £2,000 First Prize in the Senior Moot 2016, held on 5th May in Court Two of the Supreme Court of the United Kingdom in Parliament Square, London. The event was generously sponsored for the first time by Falcon Chambers, Barristers and Arbitrators specialising in real estate. 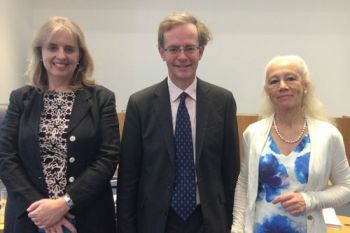 The competition was judged by Professor Catherine Barnard of the University of Cambridge and Hugh Mercer QC of Essex Court Chambers. The mooting question tackled in the Senior Moot 2016 was a combination of EU Law and Conflict of Laws. The winner of the Second Prize was BPTC student Matthew Mills who took home £1,300, while the Finalists Matthew Collins (GDL) and Ronan Magee (BPTC) won £850 each. Esther read Jurisprudence at Oxford (Merton College) and spent a year studying at the University of Konstanz in Germany during her undergraduate degree. After that she worked in the Public Law Team at the Law Commission for 2 years and completed an LLM at the European University Institute in Florence before coming to do the BPTC at City. "The Senior Moot 2016 was held in the impressive, but not intimidating, surroundings of Court Two in the Supreme Court. The Finals Judges, Prof Catherine Barnard and Hugh Mercer QC, enjoyed the strong performances of our four Finalists, and commended them all on their hard work and achievement. We are proud as a Law School that our students are able to display such outstanding form as well as maintaining their workloads for study. The event is stellar in The City Law School calendar, and we record our gratitude to our generous sponsors, Falcon Chambers, barristers and arbitrators specializing in real property." The Law Commission is an independent body set up by Parliament by the Law Commissions Act 1965 to keep the law of England and Wales under review and to recommend reforms. The organisation is headed by a Chairman (currently Sir David Bean, a judge of the Court of Appeal) and four Law Commissioners. It proposes changes to the law that will make the law simpler, more accessible, fairer, modern and more cost-effective. It consults widely on its proposals and in the light of the responses to public consultation, it presents recommendations to the UK Parliament that, if legislated upon, would implement its law reform recommendations.